1400 people across Canada have already been heard! If you are a person affected by autism – a parent, a caregiver, a professional or you live with autism, please fill the National Needs Assessment Survey for Autism. Make sure to detail all the gaps in services and areas where you feel more assistance is required. The survey is funded by Health Canada and will give us a picture of autism in Canada. Please share with people across Canada. Spread the word, we need a minimum of 5000 people to do the survey. 1) The binder. 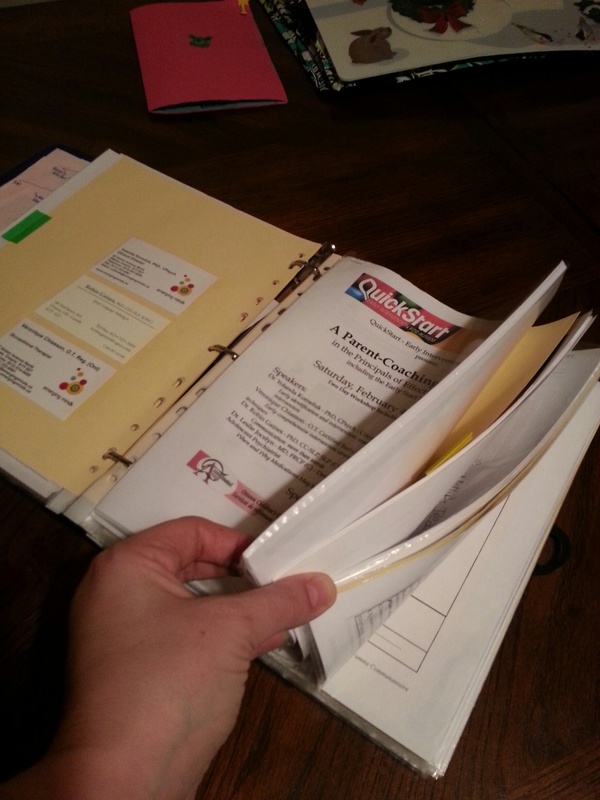 Run to your nearest dollar store and get a binder and some dividing tabs. Cheap but effective! (See picture below) Divide everything into subject matter and bring it to all appointments to access information in mere seconds. Wow the professionals with your organizational skills! All joking aside, having your child’s records in perfect order really helps out when sitting in appointments and someone needs a photocopy of a report or diagnosis letter. An added bonus is one less thing to stress about! 2) The calendar. Whether it’s the one on your phone or an old fashioned appointment book, make sure it is up-to-date at all times. Don’t wait to write an appointment on the calendar. I often take my phone calls in front of our kitchen calendar and mark appointments in as I talk. On Sunday night take a quick look at your week ahead and remind everyone what is happening that week. – what is your appointment going to be about? – who is the appointment going to be with? – approximately how long will the appointment last? – should I bring anything? – what kind of services can I expect to receive? – any other questions you may have.